BeanAir range of wireless sensor products provide ease of testing in a range of difficult industrial and transport environments. AcSoft has added high performance, turnkey wireless sensor networks (WSN) from Germany-based BeanAir to its portfolio. A cost effective alternative to wired sensor networks, BeanAir innovative WSN products offer test and time-synchronised, robust embedded measurement across a wide range of industrial, transport and military applications. Within these key target markets BeanAir WSN can be used for tests on raceways and dirt tracks, wind tunnel testing, vibration monitoring on train wheels, fault detection, comfort measurement, flight test measurement and underwater test benching. Other BeanAir applications include structural health monitoring, technical building management, environmental monitoring and condition monitoring. BeanAir has recently introduced a series of rugged, miniaturised wireless sensors with IP66/IP67 rating and 200G shock resistance making them well suited to the harsh environments that were previously inaccessible by wired sensors. Due to a maximum bandwidth of 3 KHzA (in mono-channel configuration), dynamic shock (smart shock detection technology), tilt and vibration measurement is possible. By choosing BeanAir WSN, cabling costs are significantly reduced. The cost of integration and maintenance as well as cabling weight introduce non negligible constraints that can be more expensive than the price of cabling alone. While the vast majority of wireless measurement systems show their limits in harsh industrial environments, BeanAir has designed an innovative concept based on antenna diversity allowing the optimisation of radio link quality in environments subject to random and diverse disturbance. The BeanGateway GPS integrates GPS function dedicated to test bench and telemetry applications on mobile equipment aboard trains, cars and ships, for example. With ‘GPS Geotagging’ mode, a measure can be time-stamped, geo-located with precision and transmitted to the destination of BeanScape which is a real-time supervision and monitoring system that allows users to view and manage BeanAir WSN. BeanScape also integrates an OPC server which can be blended into an IT system. The BeanAir SmartSensor system comprises a number of models for different applications. 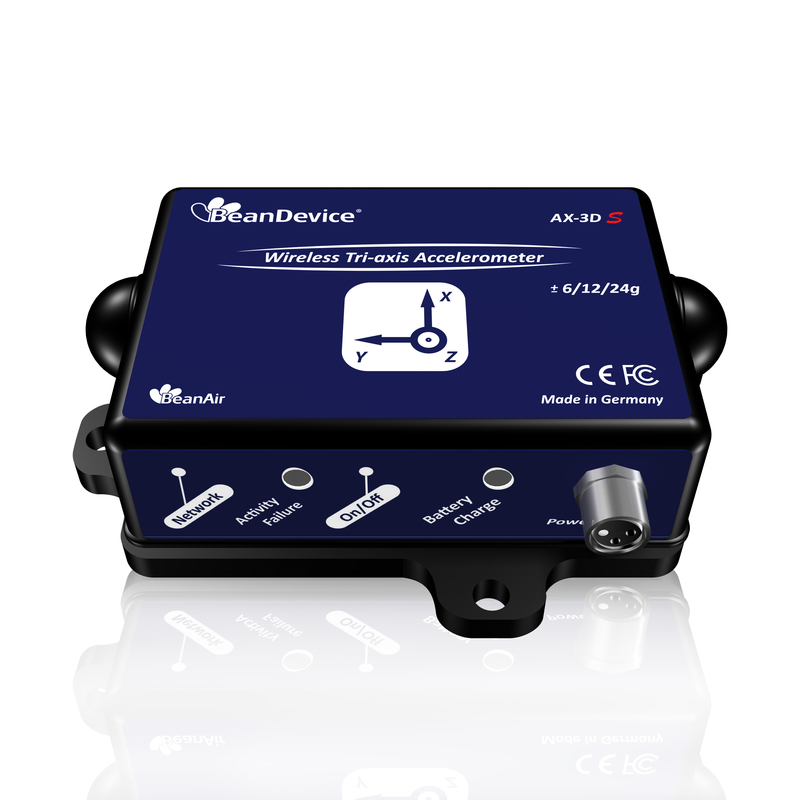 The BeanDevice AX-3D Xrange is a wireless accelerometer for dynamic measurement, vibration analysis, movement detection and inertial measurement, whilst BeanDevice AX-3DS is a wireless accelerometer designed for shock measurement. Alternatively, BeanDevice HI-INC and HI-INC Xrange is a wireless inclinometer for tilt measurement applications, including platform levelling and stabilisation, laser level rotation, slope measurement, oil drilling and axial rotor measurement.